What Is Asian Elephant Conservation? There seems to be a divergence of opinions regarding Asian elephant conservation. A common, though uneducated, opinion is that all elephants in captivity need to be released into the wild. In actual fact, that is not a feasible scenario as the wild is rapidly diminishing with human/elephant conflicts and poaching posing a constant threat to what could become an endangered species if they are left to their own devices. Several months ago, The Elephant Story held a fund-raiser auction in Singapore through the support and considerable efforts of Graham Bell and Stewart Easton of ERCE as well as our spiritual leader, John Roberts, Director of The Golden Triangle Asian Elephant Foundation. 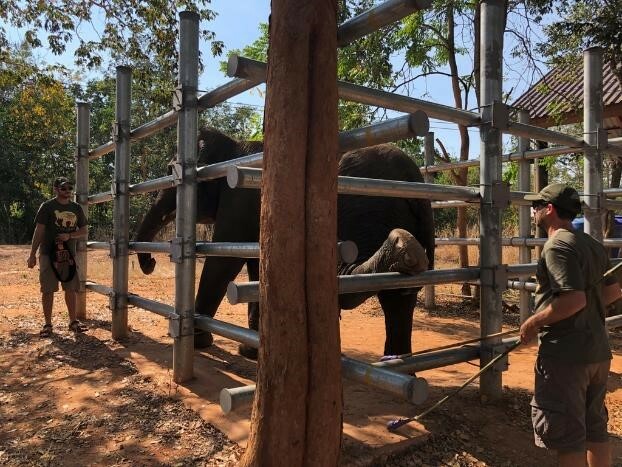 The proceeds from that event have been immediately deployed in two different approaches to elephant conservation with one focused on elephants in captivity and the other on those in the wild. Quality of life is always an issue for elephants in captivity. It begins with the training of young elephants that has evolved to a more modern approach as opposed to the barbaric methods of the past. 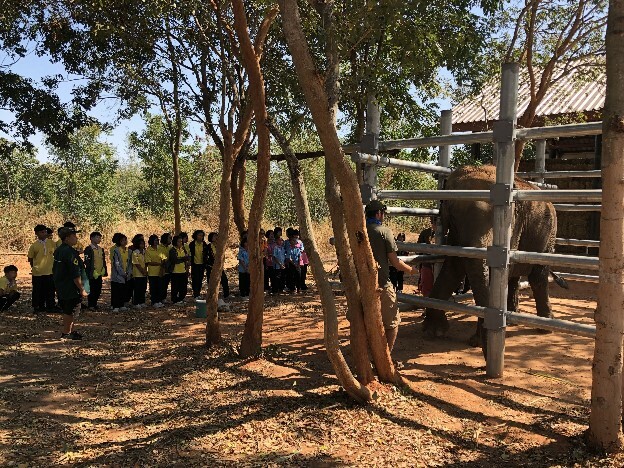 The Golden Triangle Asian Elephant Foundation (GTAEF) conducted a Target Training Workshop for some of the elephants in Baan Ta Klang, Surin, Thailand where The Elephant Story and GTAEF support native-speaking English teachers in the village schools and a veterinarian for the 300 elephants in that area. 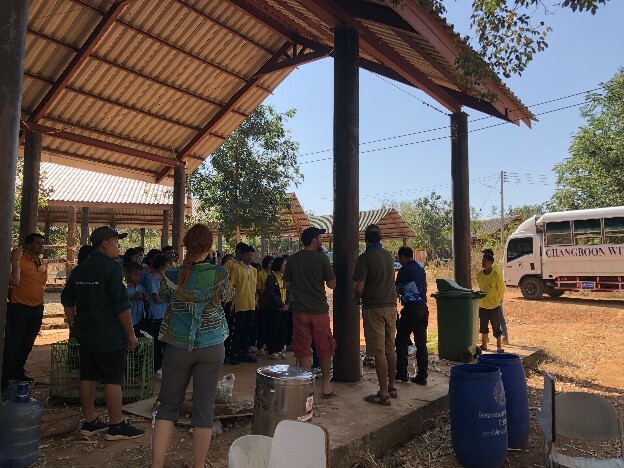 The mahout owners of ten elephants volunteered to participate in an instruction program where the elephants were exposed to positive reinforcement target training in order to safely and painlessly present their feet for nail care and other parts of their bodies for other veterinary tasks. More importantly, the mahouts were shown how elephants solve problems and think through the tasks set for them if nicely encouraged to do so. 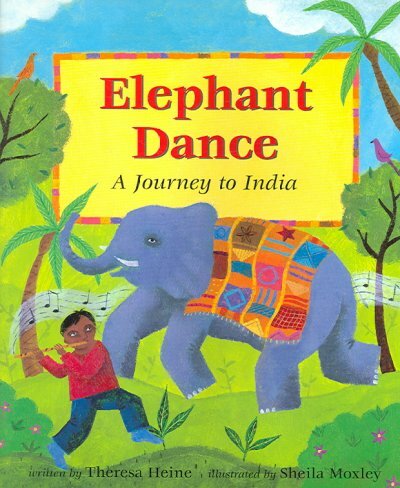 The fundamental objective is to cause mahouts to think how elephants think. As elephants are on their feet the greatest portion of their lives, care of their nails and feet is one of the most important challenges in maintaining their health and well-being. 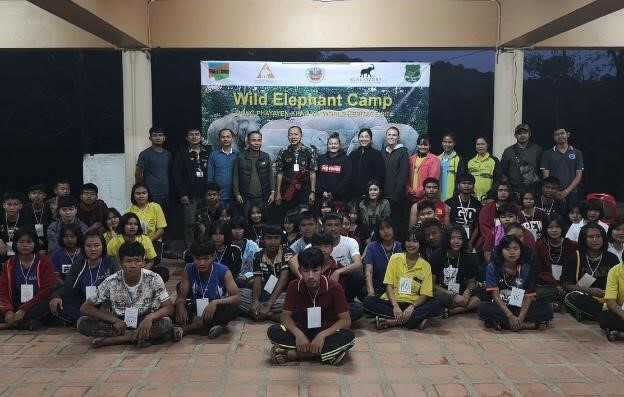 Students from the nearby Chang Boon Wittaya school came to see elephants and their mahouts being students in the training area set up in The Zoological Parks Organization (ZPO) under the Royal Patronage of His Majesty the King of Thailand. The children were transported to this open area school in the bus shown in the background which was purchased with assistance from The Elephant Story. John Roberts had the opportunity to sit in on an English lesson where he learned about New Year resolutions. We will need a future accounting of John's record in keeping any resolutions he may have made. We know they had nothing to do with beer consumption. At the end of the day, the elephants strolled back to their home. 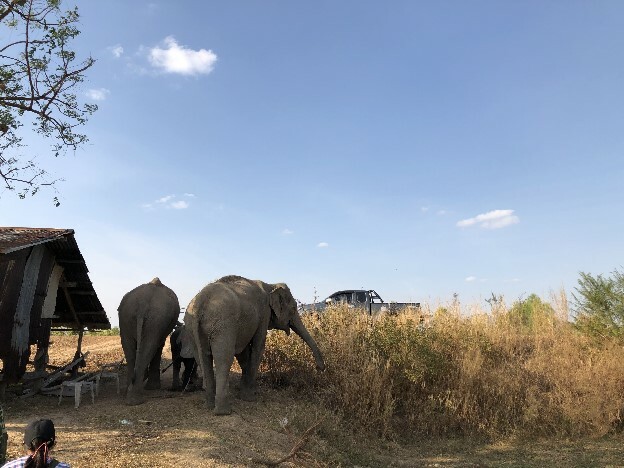 Dr. Pang, the elephant veterinarian in the village, and her crew were trained to continue and expand the efforts throughout the Baan Ta Klang elephant community. The expert trainers from Mexico, Dr. Gerardo Martinez from Africam Safari, and Dr. Rodrigo Salasa from Yumikáa Safari, have submitted blue prints for a permanent training facility to be built on the ZPO land with the program to be embedded in that facility. A special thanks also to the Elephant Conservation Center, Xayaburi's Mr. Kan Santhuone for his training skills and mahout knowledge. His Lao language capability was invaluable not only in training the elephants but also in winning over the skeptical mahouts. The three trainers then moved on to Bangkok to attend a meeting of active positive reinforcement trainers in Bangkok which resulted in the formation of The Captive Elephant Behavioral Management and Working Group. That group will write protocols and advise others aiming to help stimulate and instill positive, elephant friendly training methods throughout South East Asia. 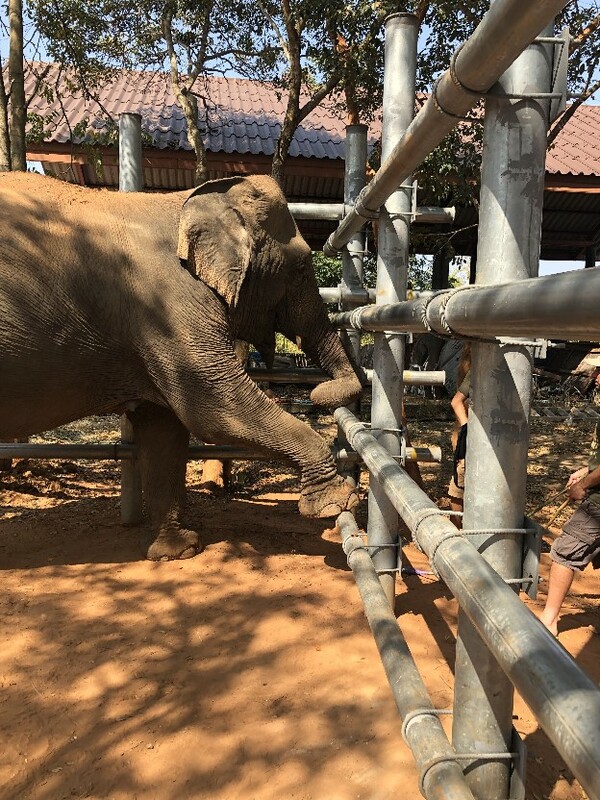 In terms of elephants in the wild, GTAEF, with support from The Elephant Story, opened the Human/Elephant Conflict mitigation watchtower on the outskirts of the Khao Yai Thai National Park. The community team there sees wild elephants on a daily basis and is fully directed toward keeping the larger community and the elephants safe. Last month, GTEAF sponsored a group of sixty students and ten teachers from Chang Boon Wittaya school to visit the Khao Yai National Park. 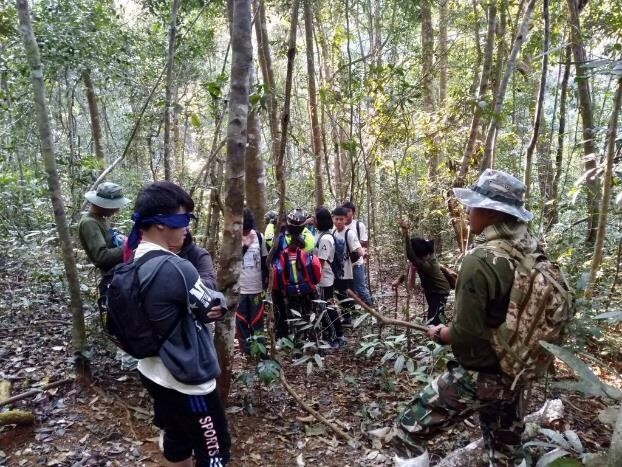 They took part in a Conservation Education Camp which included ranger skills in jungle training and survival. 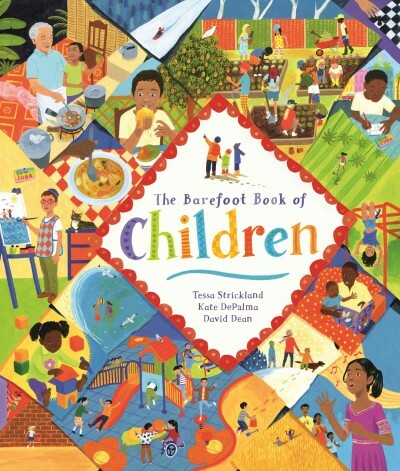 Where were they in the early seventies when the author was lost in the Cambodian jungle during the troubles? Accordingly, some of us see Asian elephant conservation efforts on two different fronts-protect the remaining Asian elephants in the wild population that will inevitably shrink as the wild continues to diminish and improve the lives of those elephants in captivity which will sustain the species. 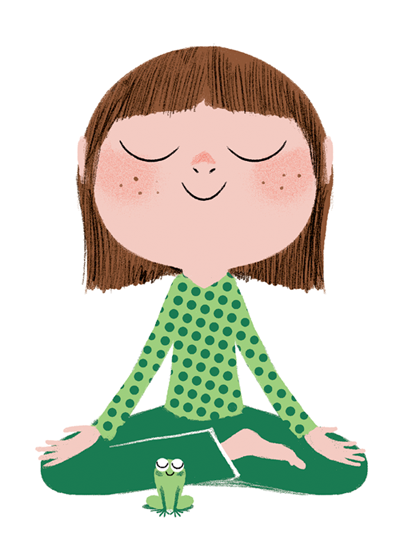 For those of you who are in the "release to the wild" camp, please realize we have a zero-sum game here. Take some time and do the research as we have seen it first-hand and it is why we continue to work on these conservation efforts. By the way, elephants in captivity must have a way to economically sustain themselves in the best and most dignified manner possible. 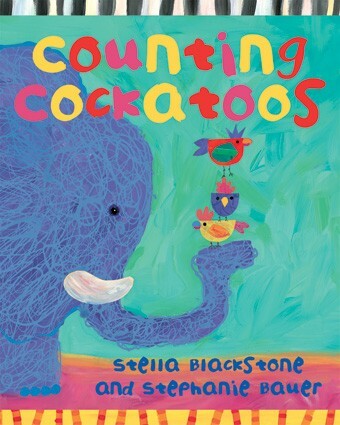 Now, how do children living in a village of 300 domesticated elephants spend spare time? They travel to see elephants in the wild. 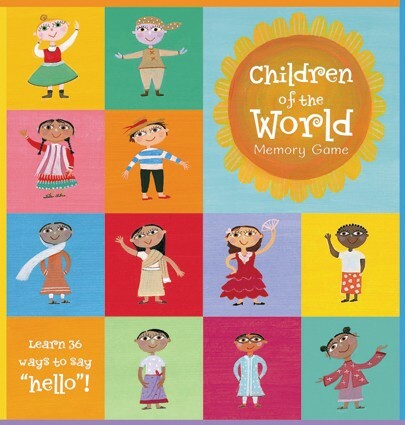 Has a child in your life woken up on the wrong side of the bed? 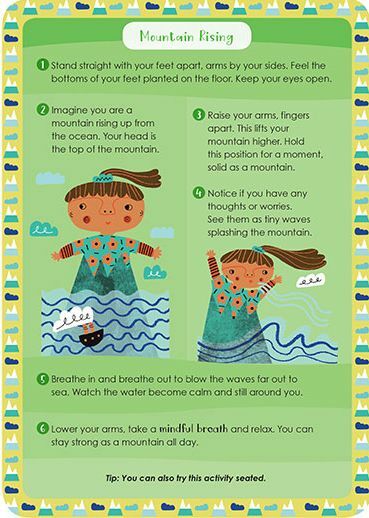 Use the breathing and visualization activities to help them notice their mood and release any grumpy feelings or worries.